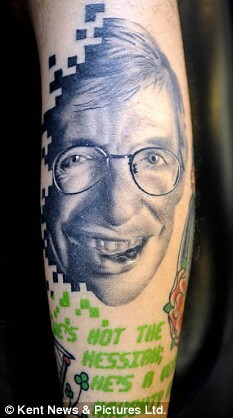 Tattoo Blog » Award-Winning Stephen Hawking Tattoo! Tattoo Blog » Celebrity » Award-Winning Stephen Hawking Tattoo! A science enthusiast and tattoo artist-in-training got Stephen Hawking’s face tattooed on his leg along with a quote from the Monty Python movie “Life of Brian”: “He’s not the messiah. He’s a very naughty boy.” Now there’s a combination of ideologies. “I read A Brief History of Time, but to be honest I didn’t understand a word, but I respect the man and that’s why I got his face tattooed on my leg,” says Jack Newton, of the UK. He goes on to call Hawking “an amazing example of how illness does not necessarily stop a man from doing great things. Newton has taken home a couple of tattoo trophies for his salute to Hawking.